TerryTown RV in Grand Rapids has been a top RV dealer in Michigan for over 40 years! So if you've been thinking about the 2019 Keystone Cougar Half Ton 34TSB, stop in and see us today for an amazing price and an amazing deal on this great Travel Trailer! We're located at 7145 Division Ave S Grand Rapids Michigan 49548 so stop in and see us or give us a call at 616-455-5590. Our friendly, knowledgeable staff can make your RV dream a reality before you know it! Place your camping chairs and picnic tables under the shade and protection of the 8' 0" awning! Traveling with this RV is no issue, with its hitch weight of 1150 lbs. and GVWR of 10500 lbs. Enjoy the walking space of this 38' 1" long, 8' 0" wide, and 11' 4" high Travel Trailer! The 3 slides offer even more room inside! The trailer is temperature controlled no matter the weather outside, thanks to the 35000 BTU furnace and the 15000 BTU a/c. 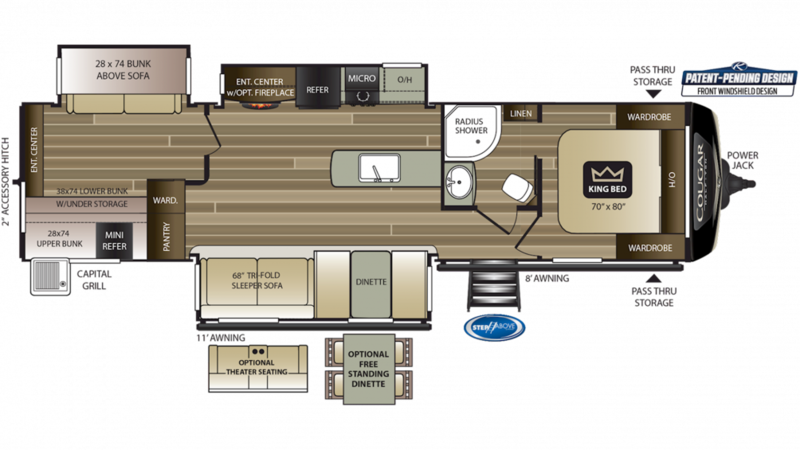 When it comes to a good night's sleep on the road, you can't beat the master bedroom in the Keystone Cougar Half Ton 34TSB! It's private, handsomely furnished, and the regal King bed is spacious and comfy! Up to 9 people can sleep safe and sound at night! If you're tired of fast food and campfire fare when you're camping, then you're going to love the awesome kitchen in this Travel Trailer! It comes with all modern cooking appliances, including a 3 burner range, 8.00 cu. ft. refrigerator, and more! You'll serve your family delicious, hot breakfasts, lunches, and dinners every day! Need to rush to the bathroom? No worries, as this RV has a Foot Flush toilet in the bathroom! You can enjoy long, hot showers throughout your trip with 60 lbs. of LP tank capacity! The used water and waste are stored discreetly in the 60 gallon gray water tank and the 30 gallon black water tank, respectively. Little ones will sleep comfortably every night in the bunkhouse, which offers cozy Bunkbeds! Make your lunch out in the fresh air and sunshine with the outside kitchen!